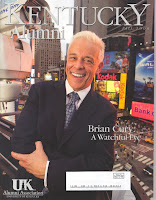 Some people have brought to my attention that the Fall 2008 Kentucky Alumni magazine printed a small update about me in the class notes area. I contacted them and they said they compiled it from a clipping service that picked it up from the Courier-Journal article back in April. Thanks to everyone who sent this in. Here's the cover.